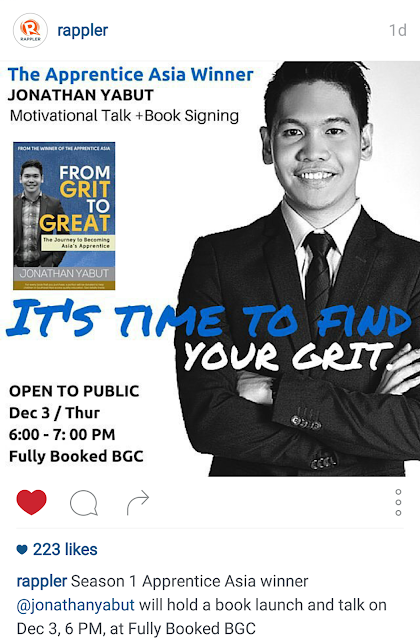 Jonathan Yabut, the proud Filipino winner of the hit reality TV show The Apprentice Asia Season 1, will be launching his autobiography and motivational book, “From Grit to Great” on December 3, 2015 at Fully Booked Forum. There will also be book signing, and hopefully our favorite selfie opportunities as well. 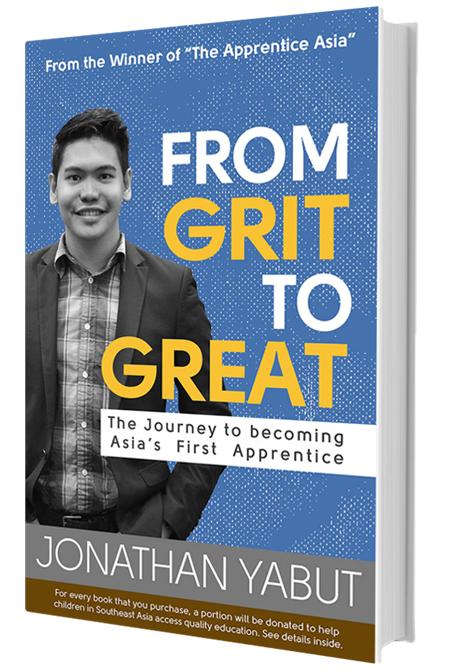 The book shares Jonathan's life journey from humble beginnings to winning the “world’s toughest job interview” to finally land him a job in one of the great airline companies in the world, AirAsia. Jonathan today is Southeast Asia’s leading business icon representing the Gen Y workforce. He is best known today as a motivational speaker and consultant for Fortune 500 Companies focusing on development and management of millennial workers. What started out as a series of posts on his popular Facebook Fan page (Facebook.com/AAJonathanYabut) became a collection of stories on how Jonathan won the show through leadership and grit. Fuelling success from grit: What is grit? How do you develop grit? Jonathan explains that you don't need to be an Einstein, a Richie Rich, nor a royalty to succeed in life—what you need is grit. Behind the scenes spilled: From bedroom to boardroom, Jon reveals juicy secrets and life lessons he learned from Mr. Tony Fernandes and fellow candidates. Hack the corporate world: From working smart (and not hard), to applying the 80/20 rule, get practical daily tips on how to climb the corporate ladder faster! Be the next Apprentice: Aspiring to win the next season of The Apprentice Asia? Learn tips and tactics in making it to the Final 12 from the winner himself! For every book that you purchase, a portion of the book’s proceeds will be donated to educational NGOs in Indonesia, Malaysia, Philippines and Vietnam*. A product of scholarship himself, Jonathan aspires to reach out and improve the quality of teaching and financial assistance to less-privileged but promising students in the region. Jonathan today is based today in Kuala Lumpur serving as a marketing director for the Tune Group of Companies managed by Malaysian business mogul, Tony Fernandes. He owns his own management consultancy firm, The JY Ventures & Consultancy. He is also an accomplished business writer for news sites such as Rappler, The Malaysian Star, and The Jakarta Post.